Looking back over the candidates for Restaurant of the Year from the last 12 months, it's glaringly obvious that I've had far more successful meals outside of the M25 than within. On the one hand this is merely a continuation of a trend which began many years ago, with the rise of Cornwall, Yorkshire and Lancashire as mature food destinations and the inevitable rise of London rents forcing independent restaurants there to get clever, or get out. At the time of my last visit I said that there was an argument to be made that this handsome mock-Tudor building in the Kentish countryside houses the best restaurant in the country. Maybe one day I will make that argument, but for now I hope they'll be happy in just being one of the best. Confident, ambitious cooking that never sacrifices flavour for technique, if you don't leave Fordwich beaming from ear to ear you haven't got a heart. If it wasn't in such a bloody awkward location, served by such a terrible train company, I'd go every week. One of the few London restaurants that have really impressed this year, Perilla started at an already impressive level and just got better and better and better. The lamb fat bread is already a thing of legend, but these guys never sit still, and in two visits it was the only element that remained unchanged - everything else was brand new, inventive, big on flavour and served with heart. The local restaurant everyone wishes they had. Honourable mention: The relaunched Tamarind, Mayfair whose 'Pink peppercorn chicken' will live long in memory, and Kutir, Chelsea, the latest success in chef Rohit Ghai's already impressive CV. Though the names behind St. Leonard's already had a pretty good pedigree when it came to running restaurants, nobody (least of all me) was prepared for quite how good this place ended up being, and quite how boldly different it dared to be. Best described as seasonal cooking with the odd Asian influence, nowhere else in town is anything like it, and there's hardly a thing on the menu you wouldn't want to order, eat, and order again, from the exquisitely constructed dressed oysters to vast sharing portions of Challans duck, or monkfish bronzed with sea buckthorn molasses. Add in an interesting wine list (I know it's interesting because I don't recognise any of the names) and sparkling service, and you have one of the best places to drop a chunk of your dinner money. Honourable mention: Anglo, Farringdon, which served a cracking tasting menu in October and can cook a bit of fish better than most I can think of. OK, so 'best in Liverpool' sounds rather like damning with faint praise, but please take my word for it that there's nothing qualified about my praise for Röski. A tasting menu full of passion and skill and, yes, local humour (the 'Scouse' served on a glass skull still makes me smile), that there is finally - finally a fine dining restaurant worth recommending in town would make this Liverpool-born blogger proud enough, but that I left this handsome Rodney Street location having had one of the best dinners of 2018 made me want to shout from the rooftops. Come to Liverpool, foodie thrill-seekers and restaurant junkies. They're ready for you now. When I said on Twitter that Mana was a better restaurant than Noma, I was perhaps being a little hyperbolic. I'd had a lovely evening in great company and quite a few matching wines. But I will say this - I enjoyed Mana, the experience of eating there and the exhausting effort that they put into all their dishes, much more than that place in Copenhagen, because perhaps all that food needed, intelligent and influential though it undoubtedly is, was to be treated to a bit of Manchester heart and soul. Dishes that at Noma left me cold and confused were transformed in this beautiful, energetic space into something much more relatable, and relevant. Noma was impressive, Mana is joyous. But you don't need to worry about comparisons and rankings from nerds like me - just go, you'll love it. I promise. Another restaurant inspired by New Nordic cuisine, and another restaurant in a smart, friendly space in an industrial Northern town. From the very first bite of the artfully-constructed snacks to the final sip of sticky wine, Jöro seems determined to make you fall in love with it at every turn, not just from the incredible food or sparkling service but that at the end of it all they'll give you a bill for about half what you might expect to pay elsewhere (the tasting menu is £45) and they don't even ask for a tip. I love fine dining, I really do - I'll cross continents for it, organise entire holidays around it, pay through the nose for it. I'm lucky to have had some truly exceptional meals that a great deal of very talented people toiled long hours to make, and I consider every one of the places above to be more than worthy of the money they're asking. But the very best food I've eaten all year is made by a chef working in a kitchen alone (I think) out of a pub buried deep in the Lancashire countryside, whose every plate of food is touched with utter magic. The Parkers Arms is, on one level, "just" a pub. It serves pints of beer, it has a nice log fireplace in winter, it does pies and fresh fish and steak and chips. It does these things because it is a pub, and people expect these things from a pub, and if people expect pies and chips then why not just make the best bloody pies in the country, and gorgeous, golden-brown triple-cooked chips to go with them. But don't stop there, because the menu at the Parkers is both a hymn to the seasons, and a hyper-local tribute to the bounty on their Bowland doorstep. Many ingredients are gathered from the surrounding hills and farms, and indeed one in dish of grouse I had a year or so ago there wasn't a single ingredient from further than a mile away, including the bird itself. Cooking like this, making the very best of what's available that day, requires a dexterity and imagination in the kitchen very few restaurants at any level possess - to find it in an otherwise unassuming country pub filled with a happy mix of locals, hikers and dogs is something truly special. It's the platonic ideal of a country pub, that somehow surpasses my extraordinarily high expectations every time I go, and I really can't praise it enough. So, let's have more of the same in 2019, please - at least, for as long as we can. Along with the rest of the world I'm hoping to God some of the more dire predictions concerning Brexit don't come true - but I guess we'll know soon enough. And if we do end next year foraging for tinned goods in a post-apocalyptic wasteland well, at least we could say it was good while it lasted, and it was a pleasure to have all of you along for the ride. So many thanks, once again, for reading and following, and have a very Happy New Year. I try to avoid reading other reviews or first impressions of restaurants before making my own visit. Unfortunately, thanks to the proliferation of social media (and my own distressing addiction to it), seeing the odd Instagram dish or catching a significant quote from a tweeted review is inevitable, and probably does have a bit of an impact on my eventual reaction to a place. But I try, at least, to go in cold, and any similarities between the opinions - living or dead - stated on this blog and any you may have seen in the national press in the weeks or months beforehand are largely coincidental. 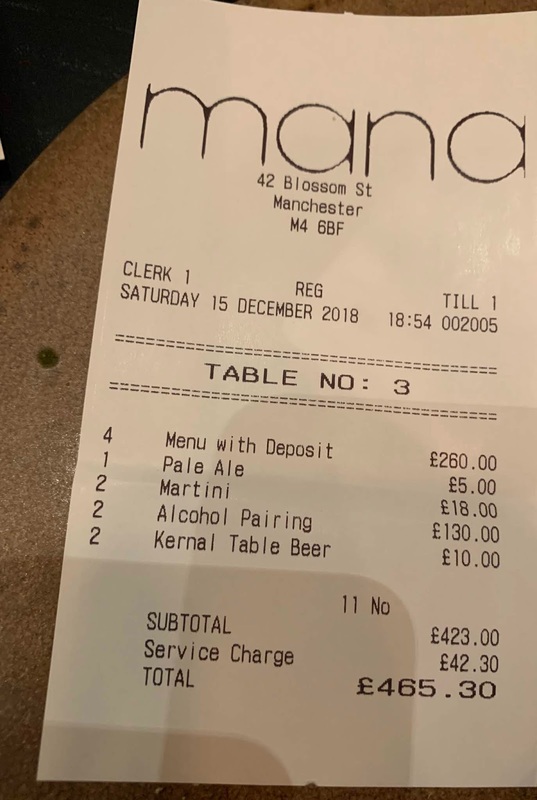 Now, Mana is barely two weeks* old and has had no significant press (to my knowledge) of any kind so I would have come to it knowing little more than the basics - that it's a venture in the swishly renovated Ancoats district headed by an ex-Noma chef - were it not for someone on my timeline linking to a Instagram account snarkily pointing out that some of the dishes snapped in the Mana kitchens during the tentative first few days of friends and family testing bore more than a passing resemblance to those served at Noma. The tone of the Instagram account (I can't link to it now, it appears to have been deleted) annoyed me; it should be of no surprise to anyone that a chef that trained at Noma - whatever you think of it, unquestionably one of the most influential restaurants in the entire world - would want to use some of the things he'd learned there to launch his first solo venture. But even if Simon Martin came to Manchester with the sole intention of creating an exact clone of Noma on the cobbled streets of Ancoats, so bloody what? Wouldn't that still be an astonishing achievement? Wouldn't people still want to try strictly seasonal, foraged and technically impressive New Nordic cuisine for half the price it's on offer for in Copenhagen? Wouldn't that still be something Manchester could be exceedingly proud of? I mention Noma, then, because it is, after all, the woolly mammoth in the room and yes, some of the dishes owe a clear debt of technique and terroir to our Danish friends. But here's the thing. I admired Noma more than I loved it. At its best it was technically stunning but a lot of the dishes just left me cold. And I honestly believe, without a shred of a doubt, that Mana is a better restaurant. OK, I admit that's quite a claim. You're going to take a bit of convincing. So let's begin at the beginning, with a lovely stoneware mug containing a dark mushroom broth "to warm us up after the journey", which was very thoughtful of them as it was freezing rain outside. It was rich and comforting, easily enjoyable enough on its own but a little bouquet garni of herbs added extra heady notes of thyme. I've been writing about restaurants long enough to know that it's the simplest-looking things that often are the hardest to get right, so I'm sure this took quite a bit of skill. "Winter branch" was a flute of some kind of cracker, filled with a gentle horseradish cream and topped with thyme pesto. It dissolved gracefully in the mouth, releasing a pitch-perfect balance of dairy and heat, and just look at the lovely presentation, nestled in amongst dead twigs and leaves like a winter forest floor. This bit of puffed rind came loaded with a smooth liver paste and a blob of some kind of plum chutney. On top, neat discs of cep mushroom dusted with (I assume also cep) mushroom powder. It was intelligently constructed and using some clever techniques - the liver paté itself was supremely smooth - and notably one of only two courses out of 14 that involved meat of any kind (which are easily substituted if required). Mana is a good place to take your pescatarian friends. If the snacks so far had been an impressive warm-up, the arrival of the langoustine marked the first of a run of courses that in terms of quality and consistency I don't think I've known better since a trip to l'Enclume in 2012. Huge scampi tails, licked with woodsmoke, were presented on skewers made from spruce twigs and coated in nasturtium leaves glued on with cured egg yolk. Spruce and egg yolk is, it turns out, a marvellous foil for seafood, but the real stars here were the langoustine themselves - plump and unbelievably sweet, not undercooked but somehow so soft they practically melted in the mouth. I've never had langoustine this good before, anywhere. Then another dish which almost defied explanation it was that good. Cornish rock oysters were matched with a bit of chicken skin, and all wrapped up in cabbage. It sounds like a strange thing to do on paper, and yet the moment the little package exploded on the tongue it was, well as I say describing it accurately is tricky but it was cool and refreshing like the best oysters are but also distinctly savoury, like God's own surf and turf. Much of the success at Mana revolves around an exquisite sense of balance - not too much of one thing or another, the flavours distinct but complimentary, and the better for being together. Smoked eel yakitori was the next expression of utter joy. Arriving searing away fiercely on imported Japanese coal before being placed on a folded napkin, the blueberry glaze just accentuated the naturally sweet flavour of eel without being distracting, and conspired to be (sorry here's that word again) the best eel I can remember eating in a good while. Sometimes high-end restaurants end up so obsessed with consistency, with being "just right" every time they run the risk of forgetting that the best food has the confidence and personality to be a bit charred, a bit different. Serving eel on red-hot coals is a risk, but protected with that layer of blueberry glaze the flesh of the fish kept moist and bouncy while the blackened char added- well, for want of a better word, soul. The sauce that the shrimp tartare bathed in turned to Mexico for its flavour profile. Chapulines (that's grasshoppers to me and you) and arbol chillies created a kind of smoky, earthy vinaigrette that was so completely addictive I'm pretty sure all four of our table ended up not only drinking it from the bowl but sweeping up any last remnants of it with our fingers. Importantly - and impressively - though, the flavour of the prawns still shone through, vibrant little things at their absolute peak freshness. Peeled walnuts were something I recognised from Noma, except there they were served with a strange bland lump of sea urchin which wasn't very pleasant, and here they made far more sense alongside a serving of dense, nutty milk curds and topped with a fermented mushroom and apple marigold oil. As a metaphor for the restaurant itself - taking advice from Noma and yet somehow using those techniques to even more impressive effect - it was worthy of a wry smile; as a dish, it was yet another reason to gasp and coo. Mana aren't - yet - offering a completely vegan tasting menu, although I believe it's only a matter of time once they settle into things, and based on this dish I'm confident it would be the best plant-based dinner in the country. Charred onions, themselves sweet and prettily arranged, were surrounded by a sauce made from fermented barley and kelp, hitting all the pleasure points of sweet and sharp, earthy and buttery in one go. Oh, and apologies if it turns out this dish isn't vegan - I'm only guessing it is - but I bet at the very least it could be. In much the same way as the langoustine astonished with its marrying of seafood and pine, a slice of smoky celeriac draped over a stupidly generous mound of Devonshire crab was a match made in Nordic heaven. But a stroke of genius was to add to this a broth made of masa - corn - with the accompanying unique and distinctive "soily" (for want of a better word) aromas, turning the whole thing into a kind of liquid crab taco. From here, it's probably fair to say that Mana pulled back slightly from the very limits of perfection, but even when playing slightly safer there was still a whole lot to love. I spotted a familiar technique in the next dish of winter veg painted with "scallop fudge", and in all fairness to Noma, I loved the match of the sweet, sticky seafood and crunchy greens just as much back in Copenhagen as I did here. So what I'm saying is that the most familiar and least revolutionary (though still wonderful, obviously) dish at Mana is at least as good as one of my favourite dishes at The Best Restaurant In The World. That's what I'm saying. Bread arrived next, a sourdough so good, with its delicate crust and warm, sticky crumb that it quite rightly deserved a course to itself. The butter - with an almost sugary richness - was apparently made by a single woman in Norway, using milk from her own small herd of cattle. It was a pretty much unbeatable match, although if I may just interject the one qualifying note in this entire review, it wasn't quite as good as the bread served down the road at Where The Light Gets In. Still, coming runner-up to them is hardly much of a criticism. The final savoury course was a huge, bright-white chunk of poached cod, soft and yielding but retaining nice defined flakes, topped with a couple of leaves of salty sea aster. With this, "baked artichoke and oxalis" masquerading cleverly as parsley sauce, and as everyone knows, there's no better way of serving cod than with parsley sauce. Pre-dessert was a silky sheep's milk frozen yoghurt topped a shocking green pile of sorrel "kombucha", a concoction so mouth-puckeringly sharp it was less a palate cleanser than a palate chemical peel. But in a good way - the vinegar hit carried with it a huge amount of earthy vegetal flavour, which sat very well with the yoghurt. Finally, reindeer moss from Skye - yes actual moss - which had been treated to some clever technique rendering it as delicate as shredded wheat, blasted with chocolate flavour. The sadness of the reality of the last course was tempered with the joy of eating this strange creation, role-playing as a woodland creature on a dark highlands night. So, there. I've made my case. Have I convinced you? I'll be the first to admit that I didn't get as much out of Noma as others have, and perhaps what Mana are doing - demystifying and making the most bewildering excesses of the Copenhagen gastro-temple more accessible and enjoyable - was always more likely to win the heart and mind of this particular reverse snob than the unfiltered, uncompromising original. But if I didn't "get" Noma than I certainly can't be the only one, and it was clear from the very first bowl of mushroom soup that Mana are in the business of ensuring their customers are flattered with heavenly textures and strong, lovingly considered flavours, rather than showing off the most obscure way of serving pickled weeds then sitting back for a round of applause. OK, perhaps that's unfair on Noma. They are, after all, a good chunk of the reason Mana exists at all, and that Mana exists at all is a reason for profound celebration. This cathedral-like space, populated by enthusiastic young men and women right at the top of their game, is serving some of the best food I've had the pleasure of eating in my life, and it's barely two weeks old* - as time goes on, and their confidence grows I'm sure the more obviously Scandi-influenced dishes will make way for others even more wonderful, closer to the generous, soul-affirming propensities of the Mancunian kitchen team. And you can bet I'll be back to try it when they do. Just like at Roski in Liverpool, or Where The Light Gets In in Stockport, and yes up at Moor Hall near Ormskirk, it seems like being based in the North of England is not only not the disadvantage it once was for making a living from fine dining, but a significant and lasting advantage. The combination of no-nonsense Northern generosity of spirit matched with world-class techniques forged in the wood fires of Scandinavia has created something uniquely of its time and place, and utterly magical, and after so many years of false starts and Michelin snubs, it seems Manchester has, for the second time in two years, found itself host to one of the best restaurants in the world. Book now - these guys are going places. *Mana is in fact two months old, not two weeks. Still a bloody impressive show. Though the Duke of Richmond weren't to know it, the success or failure of our entire evening at this handsome new(ish) gastropub in Hackney rested on one dish. Fairly or unfairly (alright then, unfairly, really), the moment I spotted "Cornish crab butty" on the bar menu I knew two things. One, that it had to be absolutely the very first thing I ordered and two, that if it didn't live up to my unreasonably high expecations then no matter how good anything else was I would probably end up sulking into my Old Fashioned. 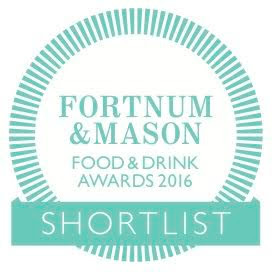 So let's start with that crab butty. A very healthy amount of crab, heavy on the brown meat which is always a delight, is presented with a few sprigs of samphire inside a very impressive brioche-scone style bun which is gently sweet and firm without being chewy. But the real genius is the addition of some skin-on fries into the mix, which bulked it out into something far more substantial without, crucially, losing any of the impact of the crab. It was all very clever stuff, and that rarest of things - a genuinely new way of making a crab sandwich. With that unofficial test out of the way, we were free to relax and enjoy the rest of our dinner, and by golly enjoy it we did. Birthday (not mine, this time) gatherings are always a good excuse to bed in and graze the furthest reaches of a restaurant menu, and with a good 8-10 of us occupying an, er, increasingly raucous corner of the Richmond over a period of about four hours, it's safe to say that between us we covered most of it. Unfortunately, due to the fact that we polished off almost as many bottles of wine as we did dishes per person, my recollection of a lot of what happened is a bit... patchy. Still, I'll do my best. I remember the cheese well enough. A supremely classy selection from Neal's Yard, here we have (from the bottom, clockwise) Mrs Kirkham's Lancashire (as good as ever), Tymsboro goat's cheese (citrussy and salty), Gubbeen (another old favourite, a washed-rind Irish) and finally Sparkenhoe, a rare example of an unpasteurised blue. They came with a very generous amount of home made fennel seed crackers which were almost as much fun as the cheese itself, and something called "orchard jelly" which I didn't try. But it looked nice enough and I didn't hear anyone else complaining. I felt like we got quite a lot of partridge[*see footnote] for £17; for some reason I remember these birds being on the small side but this one felt like about the size of a grouse, which meant there was plenty of it, with its deep red flesh and gently browned, salty skin, to go round. It went down very well. Also popular was a neat block of chestnut stuffing it came with, all nice and crunchy on the outside, and duck fat potatoes performed their own role admirably. If I was going to change anything it would be the sauce, which was a little bit thin and wine-y for my tastes, but this was a minor niggle. I think this was the wild mushroom, celeriac and spinach pie, which if you ignore the whole pie/casserole debate for the moment (die-hard pie enthusiasts, pie-hards if you like, will try and tell you that a stew in a ceramic dish with a pastry lid is not a pie, but a casserole) definitely looked the part. 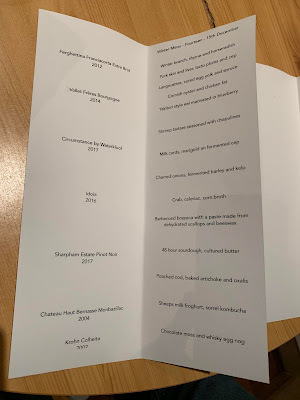 I didn't get to try any of it, but I did steal a few very envious glances at the obscene amount of black truffle shaved over the truffle mash, and from what I can gather it was all very impressive stuff. It certainly didn't last long. Now, I'll be the first to admit I've been a bit spoiled for steak in recent weeks; it's an unlucky restaurant indeed that becomes my first steak experience after back-to-back Etxebarri and Bar Nestor. So yes I'm afraid this Côte de Boeuf, generously proportioned and expertly cooked though it certainly was, just didn't have the texture or depth of flavour of the very best txuleton. Still, it easily fed three people with room to spare, so for £60 it was a pretty good deal. It came with more good fries and a nice herby bearnaise. I have a vague memory of a sort of nice moussey dessert which must have been this involving "caramelized whisky oranges", which sounds so good I'm a bit annoyed I can't remember more about it. But I think that's all the detail you're going to get out of me on this meal. 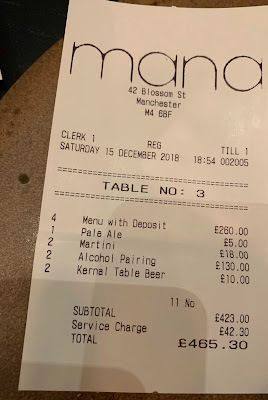 God knows how we managed to get through so much wine; clearly people from other tables were ordering bottles on our bill - that's the only explanation I can think of which doesn't paint us as some kind of state-school Bullingdon Club reprobates so that's the explanation I'm sticking with. I intend to launch a full enquiry to get to the bottom of the matter, like Trump did when he lost the popular vote. 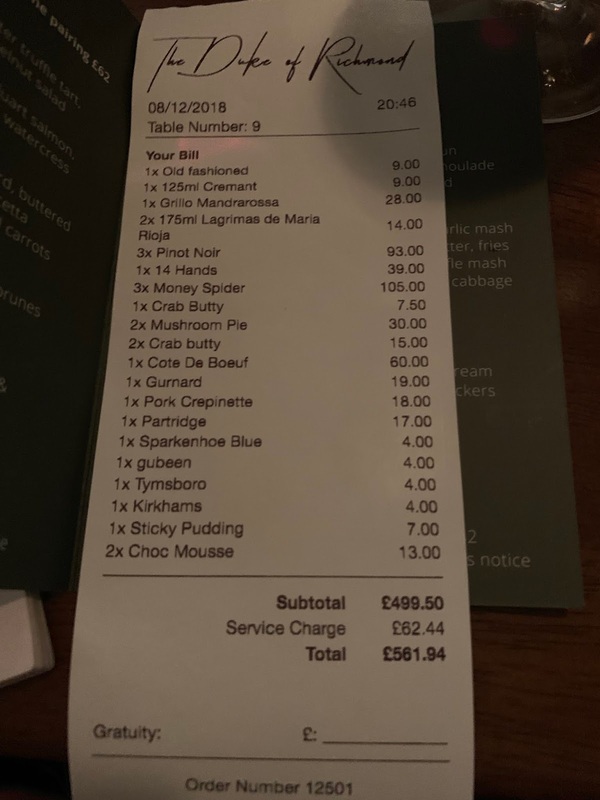 Anyway, long story short is you don't need to spend anywhere near the £561.94 our table did at the Duke of Richmond to have a good time. It's a fantastic restaurant, led by a fantastic and intelligent kitchen (Tom Oldroyd now splits his time between here and his eponymous restaurant on Upper Street, which is also well worth a visit), and Hackney is very lucky indeed to have it. I'll almost certainly be back, and almost certainly will not drink as much and remember much more about the meal. Maybe. Possibly. I'll try, at least.